It's been quite remiss of me that in all the cheese I've shown so far, none have been blue cheese. What better way to redress the situation then to show the 2006 Champion of the 78th Annual British Empire Cheese Show held in Ontario, Canada. 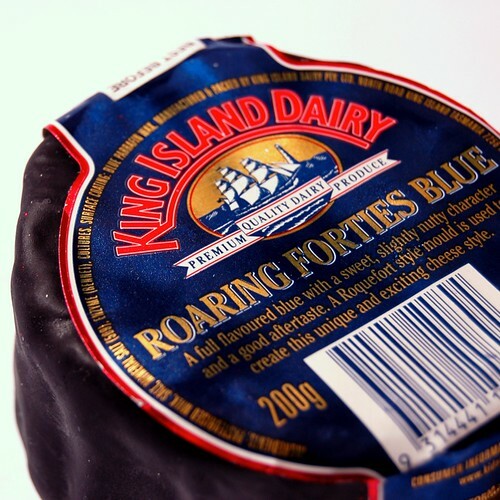 The cheese in question is the King Island Roaring Forties Blue. This is the second cheese I've shown from King Island Dairy - if you'd link a reminder, just follow this link. I should add that the name "Roaring Forties" refers to the gale winds that lash King Island - the island itself is situated at 40° latitude. 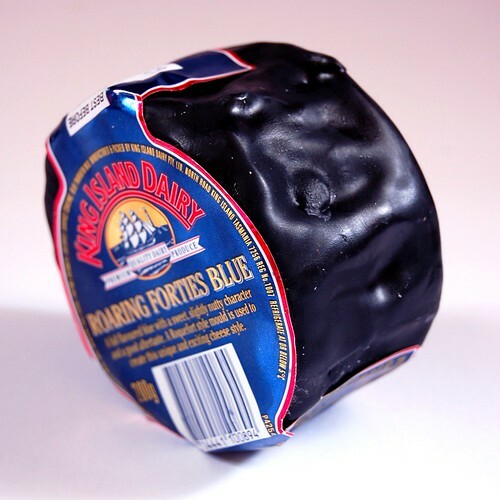 Underneath the distinctive and knobbly blue wax you'll find a full flavoured rind-less cheese made from pasteurised cows milk and inoculated with Roquefort style moulds. 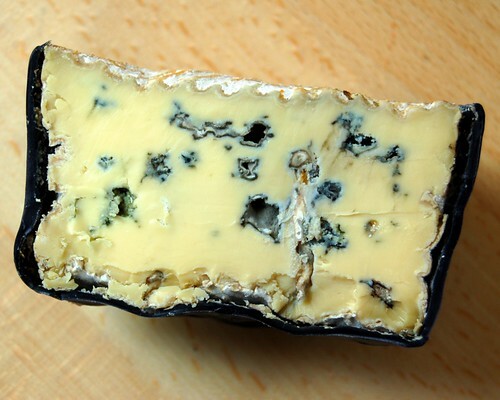 After four to five weeks of maturation, the moulds have developed inside the cheese and it's then dipped in that dark blue wax. In it's oxygen deprived state, the moulds stop developing and the milks sweet and nutty characteristics appear. When sliced you'll notice that it's not as heavily veined as a Gorgonzola - it's more the case of having pockets of blue. The cheese is quite creamy and not overly salty and has an excellent mouth feel - there's a good length of flavour in the palette. I'd class this as the type of Blue you'd give to someone who is a bit unsure of the whole "blue cheese" thing. It's appearance isn't overly confronting and there's enough blue free bits to tempt the most cautious. It's certainly a cheese to consider for that Christmas cheese platter.